What's that? You haven't played the original Fieldrunners in ages? Here are six reasons why you should go back to it. 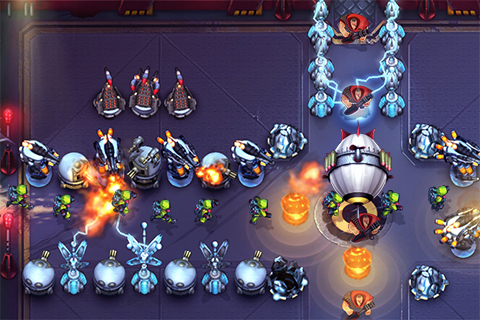 Fieldrunners 2 has consumed more hours of free time than we care to admit. Quite honestly, we could use a break, and with that being said, we plan to put the game down and pick up...well...the original Fieldrunners. In a surprise reveal, developer Subatomic Studios just updated its critically acclaimed prequel with six very intriguing features. Not only that, but the price was cut by 66 percent, with the game now costing $0.99. -All artwork recreated for full Retina display support. -Extended soundtrack available on iPhone for the first time ever! -32-bit colors for iPhone 4 and up for a richer experience. -Adjustments for super precise controls. -Double tap to zoom for quicker movement. -Optimizations to make the game run faster. But Fieldrunners is so old by iOS standards. Why bother updating it? Marketing and PR Manager Alec Shobin: "Fieldrunners originally launched in 2008 with entirely hand painted artwork, so when the Retina display came out, there was no simple way to increase the resolution of our game, we had to recreate everything. Fieldrunners has a prestigious history though, so it was really important for us that we update the game so that people with newer devices could get the full experience. Fans have been asking for Retina support, as well as usability adjustments, like more precise controls, double tap to zoom, and optimization improvements, so we threw all of those in as well. Overall, this is a huge update that we're really proud of and we think fans will definitely appreciate it." "Now that Fieldrunners 2 is out, we knew we had to go back and give the original Fieldrunners the big aesthetic update that it deserved," said Jamie Gotch, CEO of Subatomic Studios. "Not only did we completely redraw the artwork in a higher resolution for the Retina display, but we also added the full soundtrack for the first time ever on iPhone, and added support for 32-bit colors [on the iPhone 4 and up] to give fans richer environments, enemies, and towers." Hey, it's great to see such an outstanding game become even better, and with that, here are some links to check out.